Although these operations are probably familiar to you, the Python symbols are different from the mathematical symbols. A common error is to use a single equal sign (=) instead of a double equal sign (==). Remember that = is an assignment operator and == is a relational operator. There is no such thing as =< or =>. n%2 == 0 or n%3 == 0 is true if either of the conditions is true, that is, if the number is divisible by 2 or 3. Finally, the not operator negates a boolean expression, so not (x > y) is true if x > y is false, that is, if x is less than or equal to y. This flexibility can be useful, but there are some subtleties to it that might be confusing. You might want to avoid it (unless you know what you are doing). if statements have the same structure as function definitions: a header followed by an indented body. Statements like this are called compound statements. There is no limit on the number of statements that can appear in the body, but there has to be at least one. Occasionally, it is useful to have a body with no statements (usually as a place keeper for code you haven’t written yet). In that case, you can use the pass statement, which does nothing. pass          # need to handle negative values! elif is an abbreviation of “else if.” Again, exactly one branch will be executed. There is no limit on the number of elif statements. If there is an else clause, it has to be at the end, but there doesn’t have to be one. The outer conditional contains two branches. The first branch contains a simple statement. The second branch contains another if statement, which has two branches of its own. Those two branches are both simple statements, although they could have been conditional statements as well. If n is 0 or negative, it outputs the word, “Blastoff!” Otherwise, it outputs n and then calls a function named countdown—itself—passing n-1 as an argument. What happens if we call this function like this? The execution of countdown begins with n=0, and since n is not greater than 0, it outputs the word, “Blastoff!” and then returns. The countdown that got n=1 returns. The countdown that got n=2 returns. The countdown that got n=3 returns. A function that calls itself is recursive; the process is called recursion. As another example, we can write a function that prints a string n times. If n <= 0 the return statement exits the function. The flow of execution immediately returns to the caller, and the remaining lines of the function are not executed. The rest of the function is similar to countdown: if n is greater than 0, it displays s and then calls itself to display s n−1 additional times. So the number of lines of output is 1 + (n - 1), which adds up to n.
For simple examples like this, it is probably easier to use a for loop. But we will see examples later that are hard to write with a for loop and easy to write with recursion, so it is good to start early. In Section 3.10, we used a stack diagram to represent the state of a program during a function call. The same kind of diagram can help interpret a recursive function. Every time a function gets called, Python creates a new function frame, which contains the function’s local variables and parameters. For a recursive function, there might be more than one frame on the stack at the same time. As usual, the top of the stack is the frame for __main__. It is empty because we did not create any variables in __main__ or pass any arguments to it. 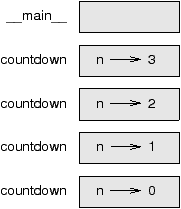 The four countdown frames have different values for the parameter n. The bottom of the stack, where n=0, is called the base case. It does not make a recursive call, so there are no more frames. Draw a stack diagram for print_n called with s = 'Hello' and n=2. Write a function called do_n that takes a function object and a number, n, as arguments, and that calls the given function n times. This traceback is a little bigger than the one we saw in the previous chapter. When the error occurs, there are 1000 recurse frames on the stack! The programs we have written so far are a bit rude in the sense that they accept no input from the user. They just do the same thing every time. Python provides a built-in function called raw_input that gets input from the keyboard1. When this function is called, the program stops and waits for the user to type something. When the user presses Return or Enter, the program resumes and raw_input returns what the user typed as a string. The sequence \n at the end of the prompt represents a newline, which is a special character that causes a line break. That’s why the user’s input appears below the prompt. We will see how to handle this kind of error later. Syntax errors are usually easy to find, but there are a few gotchas. Whitespace errors can be tricky because spaces and tabs are invisible and we are used to ignoring them. In this example, the problem is that the second line is indented by one space. But the error message points to y, which is misleading. In general, error messages indicate where the problem was discovered, but the actual error might be earlier in the code, sometimes on a previous line. File "snr.py", line 5, in ? The error message indicates line 5, but there is nothing wrong with that line. To find the real error, it might be useful to print the value of ratio, which turns out to be 0. The problem is in line 4, because dividing two integers does floor division. The solution is to represent signal power and noise power with floating-point values. In general, error messages tell you where the problem was discovered, but that is often not where it was caused. An operator, denoted with a percent sign (%), that works on integers and yields the remainder when one number is divided by another. An expression whose value is either True or False. One of the operators that compares its operands: ==, !=, >, <, >=, and <=. A statement that controls the flow of execution depending on some condition. A statement that consists of a header and a body. The header ends with a colon (:). The body is indented relative to the header. One of the alternative sequences of statements in a conditional statement. A conditional statement with a series of alternative branches. A conditional statement that appears in one of the branches of another conditional statement. The process of calling the function that is currently executing. A conditional branch in a recursive function that does not make a recursive call. A recursion that doesn’t have a base case, or never reaches it. Eventually, an infinite recursion causes a runtime error. for any values of n greater than 2. Write a function that prompts the user to input values for a, b, c and n, converts them to integers, and uses check_fermat to check whether they violate Fermat’s theorem. Write a function named is_triangle that takes three integers as arguments, and that prints either “Yes” or “No,” depending on whether you can or cannot form a triangle from sticks with the given lengths. Write a function that prompts the user to input three stick lengths, converts them to integers, and uses is_triangle to check whether sticks with the given lengths can form a triangle. Read the following function and see if you can figure out what it does. Then run it (see the examples in Chapter 4). Draw a Koch curve with length x/3. The only exception is if x is less than 3. In that case, you can just draw a straight line with length x. Write a function called koch that takes a turtle and a length as parameters, and that uses the turtle to draw a Koch curve with the given length. Write a function called snowflake that draws three Koch curves to make the outline of a snowflake. You can see my solution at thinkpython.com/code/koch.py. The Koch curve can be generalized in several ways. See wikipedia.org/wiki/Koch_snowflake for examples and implement your favorite. In Python 3.0, this function is named input. In Python 3.0, you no longer get an error message; the division operator performs floating-point division even with integer operands. If the sum of two lengths equals the third, they form what is called a “degenerate” triangle.